Monterey, Calif. – WinWard Racing’s Russell Ward battled race-long pressure and the tension of two restarts to take the overall victory in Round 15 of the Pirelli GT3 Cup Trophy USA today at Mazda Raceway Laguna Seca on Friday, earning his first series victory. Making the day that much more special was the chance to share a podium with his father, Bryce, who earned the victory in the Diamond Masters class. Ward, who started his No. 35 WinWard Racing Porsche 911 GT3 Cup car from the pole position in the Diamond Class (for Porsche 911 997.1 versions), fought pressure from 911 Design’s Loren Beggs, who in turn had to work hard to keep Aasco Motorsports Alex Kirby at bay for the entire 23-lap event. Two caution periods for one-car incidents made it that much more difficult, with no opportunity to get a gap on his competitors. Beggs had one eye forward and one eye backward as he dealt with the charging Kirby, who was trying to keep Bryce Ward and GT Technik’s Max Root behind. The five-car train separated themselves from the field over the final five laps and as the checkered flag fell, Ward took the win ahead of Beggs and Kirby, with his father and Max Root just behind. It was race victory number five for the elder Ward, who had his hands full with young Max Root, who was trying to reach his Diamond Class competitors. But Ward knew that the remainder of the Diamond Masters field was behind Root and it was in his best interest to keep his distance. 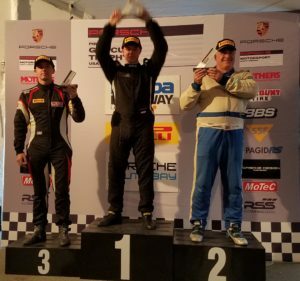 In the end, TruSpeed Autosport’s Will Lin and Competition Motorsports’ Michael Zuieback were not able to bridge the gap to Ward. In the Platinum Class (for Porsche 911 997.2 versions), it was race victory number 11 on the season for championship leader Ray Shahi in the No. 65 Sterling Collision/Newport Porsche TruSpeed Autosport machine. 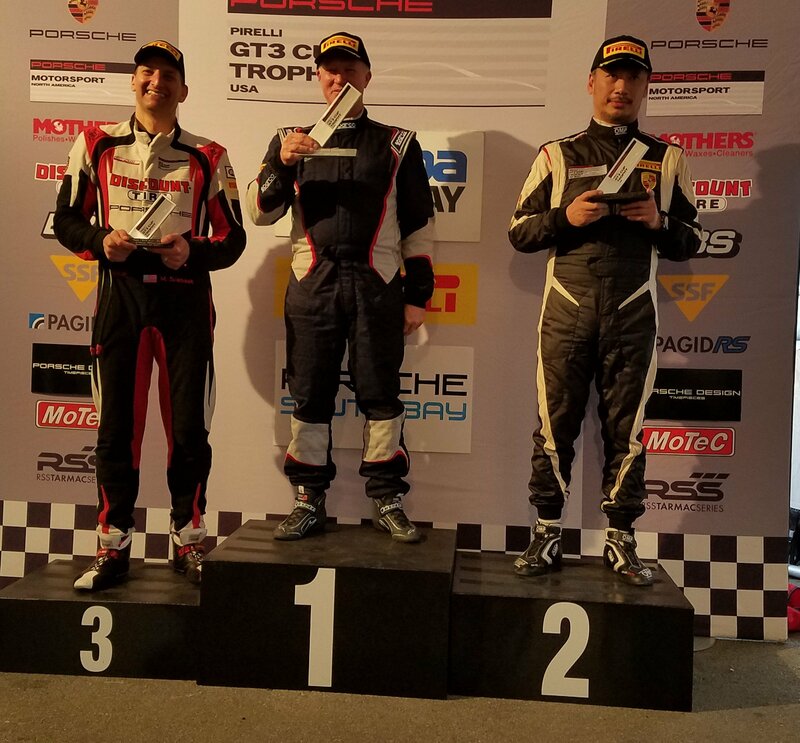 Shahi started on the class pole and distanced himself from his competitors, reaching in to the Diamond class for his on-track battles. 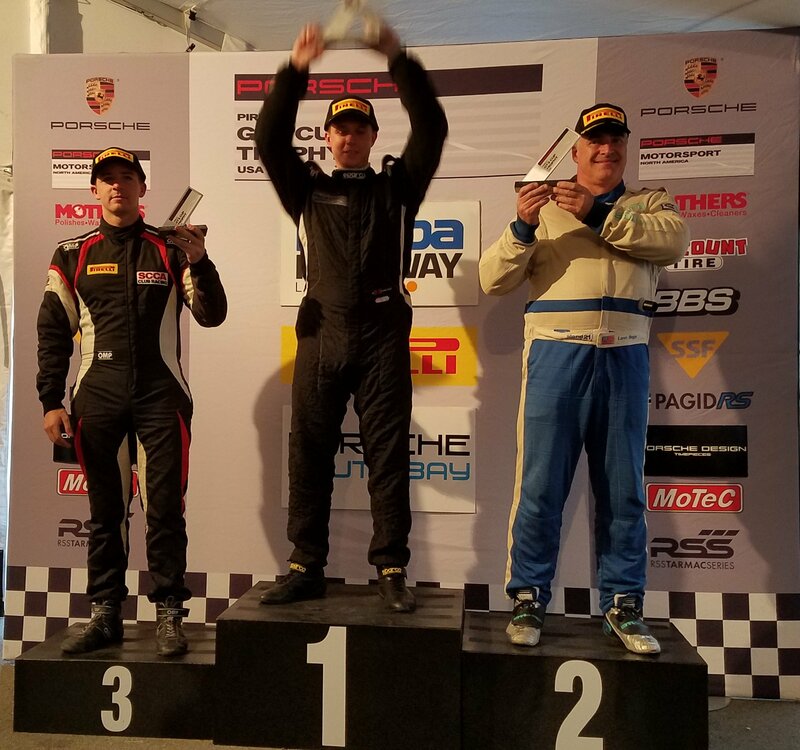 Competition Motorsports’ Jim Walsh came home in second, with TruSpeed Autosport’s Jim Slavik third. 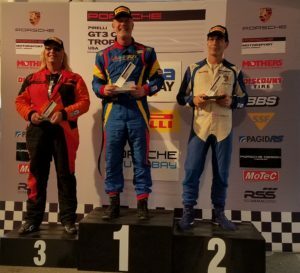 In the Silver class for Porsche Cayman GT4 Cup Cars, it was a battle between the two title contenders who each had endured incidents in last month’s event at Road America that required moving to a new car this weekend. In the end, it was Sean McAlister who brought his No. 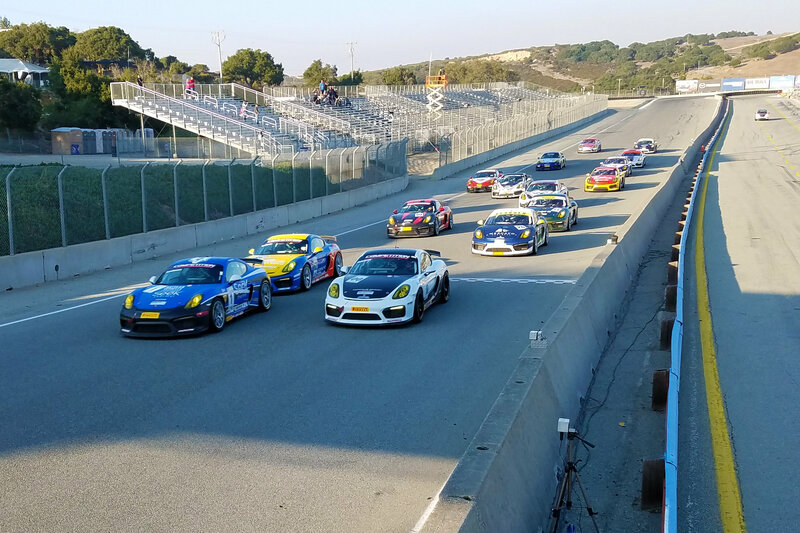 00 Porsche Cayman GT4 home in front for Bob Faieta’s Southern California-based Competition Motorsports. 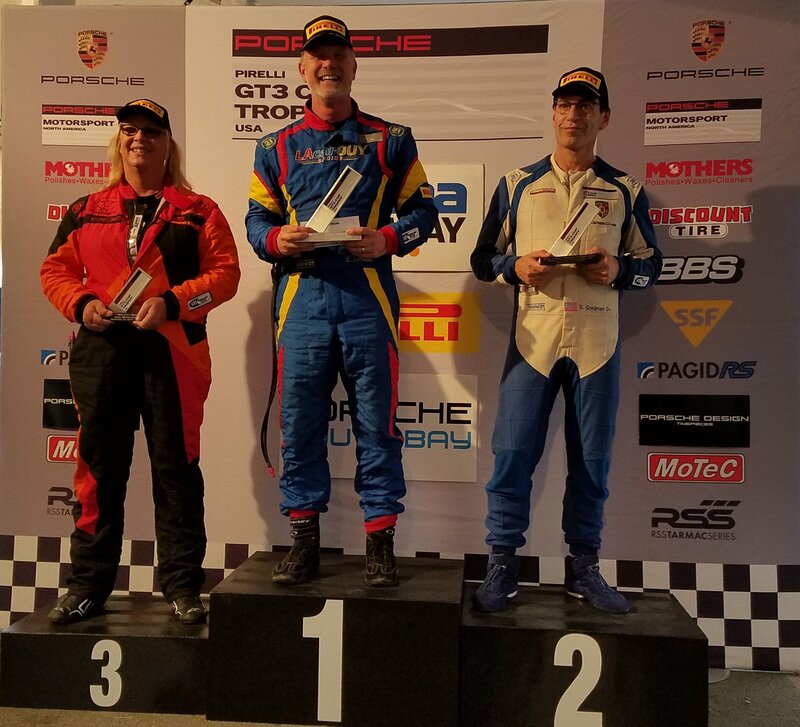 Championship leader Jeff Kearl finished second for Reardon Racing, with GMG Racing’s Brett Meredith third. 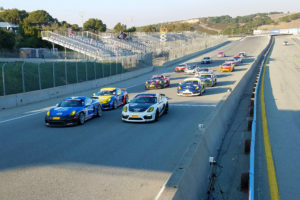 In the Silver Masters class, Competition Motorsports teammates Steve Goldman and Carl Tofflemire started one-two and were in that position when they came upon a spinning car on Lap 1. The decision of who went in which direction decided the race, with Tofflemire coming out on top, Goldman second and teammate Laura Ely third. 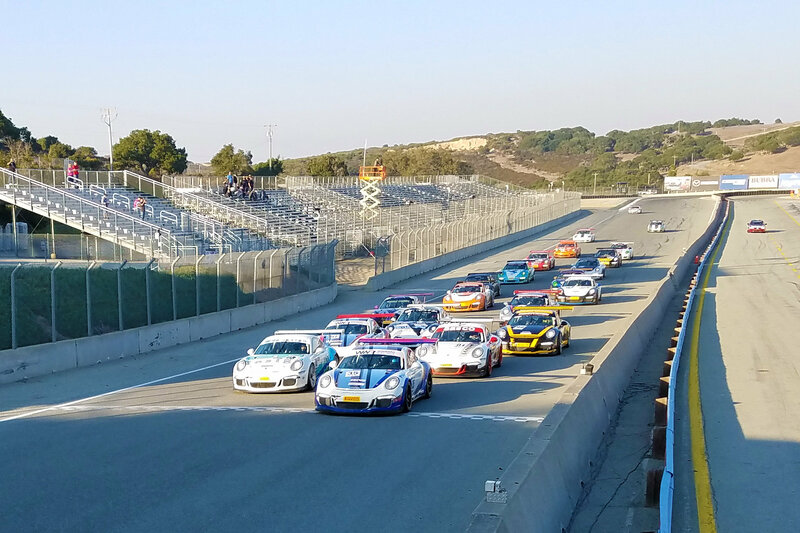 Tofflemire was quick to thank teammate Mike Sullivan for the chance to be at Laguna Seca this weekend. This entry was posted in News on October 13, 2017 by admin.